In researching material for her book Visions and Beliefs of West Ireland, Lady Gregory traveled about Galway collecting folktales and recording superstitions. Ever aware of the many references of aquatic beasts to be found in Irish literature, Peter Costello provided the following excerpts from Gregory in his book In Search of Lake Monsters. 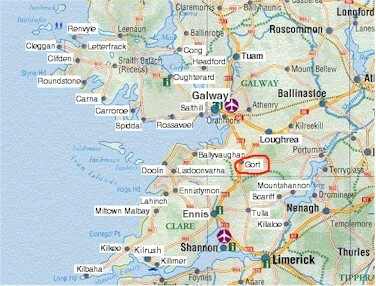 Another time, my grandfather told me, he was in a boat out on the lake here at Coole with two or three men from Gort. And one of them had an eel-spear and he thrust it into the water and it hit something, and the man fainted, and they had to carry him in out of the boat to land. And when he came to himself he said that what he struck was like a horse or like a calf, but whatever it was, it was no fish. As profuse in content as her book is, Lady Gregory presents much of the material in a confusing series of brief, sometimes seemingly incomplete, stories that are placed as almost random notes. And as for the monster, I never saw it in Coole Lake, but one day I was coming home with my two brothers from Tirneevan school, and there as we passed Dhulough we heard a great splashing, and we saw some creature put up its head, with a head and a mane like a horse. And we didn't stop but ran. But I think it was not so big as the monster over here in Coole Lake, for Johnny Callan saw it) and he said it was the size of a stack of turf. But there's many could tell about that for there's many saw it, Dougherty from Gort and others. The lake down there is an enchanted place, and the old people told me that one time they were swimming there, and a man had gone out into the middle and they saw something like a giant eel make for him, and they called out, "If ever you were a great swimmer show us now how you can swim to the shore," for they wouldn't frighten him by saying what was behind him. So he swam to the shore, and he only got there when the thing behind him was in the place where he was. For there are queer things in lakes. Since none of these accounts were taken from a first-hand source, their value is best to be taken lightly. Still, nothing appears to have been described that doesn't already echo more modern and detailed reports. Even the disturbing pursuing behavior of the last example can be found amongst the more recent encounters.